⋅ Approximately 74% of students are from out of state. ⋅ Students are from 46 states and 43 foreign countries. ⋅ Multicultural students make up 31% of the entering class. ⋅ 65% of students receive need-based financial assistance. ⋅ Median family income of students receiving need-based aid is $111,383. ⋅ Rhodes ranked 6th among southeastern colleges on the Kiplinger’s Personal Finance list of 100 private liberal arts that deliver a high-quality education at an affordable price. Founded in 1848, Rhodes is a residential college committed to excellence in the liberal arts and sciences. Our highest priorities are intellectual engagement, service to others, and honor among ourselves. We enjoy this life on one of the country’s most beautiful campuses in the heart of Memphis, an economic, political and cultural center, making Rhodes one of a handful of national liberal arts colleges in a major metropolitan area. Rhodes has the soul of a liberal arts college coupled with a real-world mindset. Our students put their liberal arts knowledge to work in the world starting their first year. Students learn, play, and serve others with a determination to grow personally and to improve the quality of life within their communities. We also encourage students to reflect on their experiences, adding a deeper degree of value as they examine what they’ve learned and how they’ve grown. Memphis is a great city with a rich history, a vibrant culture, and a big future. We are proud to call it home. There’s something for everyone in Memphis — music lovers, art appreciators, sports fans, outdoor nuts, and foodies all find plenty of adventure here. 65% of students study abroad, 75% complete internships, and 80% participate in service. beautiful residential campus and make it their own. Students pledge not to lie, cheat, or steal, and they hold one another accountable through an entirely student-run Honor Code. The Southern Athletic Association awarded Rhodes the 2017-18 Commissioner’s Cup for overall best varsity athletic program in the conference. Rhodes also had the highest number of students on the most recent SAA Student-Athlete Academic Honor Roll. The Rhodes Mock Trial team has placed in the nation’s “top ten” on 25 occasions and hold the current record for consecutive national championship tournament appearances. Rhodes is one of only four schools to have won consecutive national titles and is the only school to have accomplished that feat twice. In 2018, they were the only program with both A and B teams ranked in the top 20. For two years in a row, Rhodes was named America’s #1 Service-Oriented College by Newsweek magazine. In addition, Rhodes regularly garners accolades from the Princeton Review, U.S. News and World Report, Forbes, the Washington Post, and Fiske’s Guide to Colleges. Average class size: 14. Faculty-to-student ratio: 10:1. 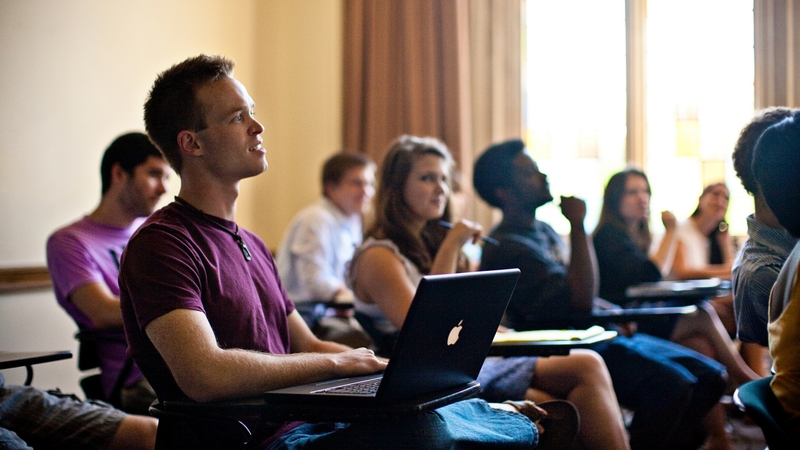 The classroom experience at Rhodes is intimate and rigorous. We value close learning, with the kind of engaging dialogue that arises when students and professors work together to investigate questions and problems they care about. 96% of full-time faculty hold the most advanced degree in their field; there are no teaching assistants. The Foundations Curriculum gives students great freedom to follow their academic interests and aspirations as they develop critical thinking skills that are fundamental to the Rhodes experience, the study of the liberal arts and sciences and lifelong learning. It also requires students to connect their classroom experience to the real world through internship, research, and/or study abroad opportunities. Students take advantage of our unique location to do research at sites like St. Jude Children’s Research Hospital, the National Civil Rights Museum, and the Memphis Zoo; intern anywhere from Fortune 500 companies to social businesses to the Mayor’s office; and serve the community through the oldest collegiate chapter of Habitat for Humanity and the longest student-run soup kitchen in the country, to name a few. Every spring, we celebrate our students’ work at the Undergraduate Research and Creative Activity Symposium (URCAS) on the last day of class. More than 50 majors and minors are available and combinations are common. The most popular include Commerce and Business, Biology, Economics, English, History, Political Science, and Psychology. Our vision of a liberal education balances rigorous classroom academics with the challenge of putting these lessons into action. At Rhodes, you’ll be encouraged to engage in research, leadership and service opportunities — and to take responsibility for shaping your educational experience to meet your personal interests and goals. Rhodes also offers pre-professional advising and course work leading to careers in accounting, architecture, business, education, engineering, foreign service, health care management, health professions, law, ministry, museum careers, music, psychological services, social services, theatre, and veterinary professions. Students are required to live on campus for the first two years; 75% do so all four years. For over a century, the Honor Code has built a campus-wide community of trust and mutual respect.You’ll find unlocked bikes and unattended backpacks all over campus, and professors trust students to proctor their own exams and write closed-book essays on their own time. With over 100 student organizations, you’ll have no trouble staying busy in anything from improv comedy to Ultimate Frisbee. Service is part of the Rhodes culture. 80% of students participate, and the Bonner Scholars program offers scholarships to up to 15 entering students who have a strong commitment to change through community. Twenty-one NCAA Division III sports and plenty of club and intramural leagues keep students active. While about half of Rhodes students participate in the Greek system, everyone hangs out with everyone else. Fraternity and sorority houses are non-residential, and most Greek events are open to the entire student body. It’s rare to find a Rhodes student who just participates in one activity, so everyone is connected to the community in more than one way. Within a year of graduation 96% of our most recent graduating class was employed, attending graduate school, or participating in full-time service. In our most recent graduating classes, more than two-thirds of our graduates reported that they were accepted by their first-choice school. The overall acceptance rates for different programs (MBA, MD, JD, and others) far exceeds the national average. Rhodes is in the top 10% of all US colleges for the percentage of students who earn Ph.D.s in the sciences and in the top 6% for psychology Ph.D.s. Career Services offers activities beginning freshman year to help students discover their interests and integrate their academic experiences with programs that develop professional skills. Mock interviews, resume bootcamps, and networking receptions prepare students to enter the work force. Alumni can return for help and advice at any point in their career. Of those members of our most recent graduating class applying to graduate/professional schools, more than two-thirds reported that they were accepted by their first-choice school. The overall acceptance rates for different programs (MBA, MD, JD, and others) far exceeds the national average.